Diagnostic Manager is a database program that has been specifically designed for use by specialist neurology practices and hospitals. You can easily and rapidly load the required information at all workstations and also print these as necessary. 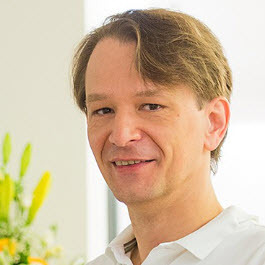 ‘At a whole new level,’ is how Dr Schiffmann would describe the changes to operations at his practice in Sinsheim since the introduction of the Diagnostic Manager. The Clinic Edition of Diagnostic Manager can be incorporated essentially seamlessly in the existing IT infrastructure of a hospital. The program both keeps the personal data of patients up to date and transmits these to the diagnostic devices. In addition, examination results are automatically transferred in PDF format via a HL7 interface to the HIS, and can thus be viewed anywhere in the hospital. The Worklist function makes it possible to send work orders from the HIS directly to the Diagnostic Manager via an HL7 interface. The medical staff can then view the current orders in the Diagnostic Manager’s clearly designed work list and call them up for processing at the click of a mouse. Thanks to the Worklist function, work processes can be optimised and valuable time can be saved. In addition to interfaces that make possible the prospective documentation of results, INNOFORCE also offers data migration services, for example, for audiogram results from existing databases. “Every year at the Sinsheim ENT Centre, some 2000 patients with vertigo are subjected to extensive otoneurological diagnostic examinations using the devices of various manufacturers. Our main problems were reconciling the various different software systems and ensuring the standardised processing and documentation of findings. Download the brochure as a pdf. Diagnostic Manager has been developed in collaboration with leading manufacturers of neurology-related devices. 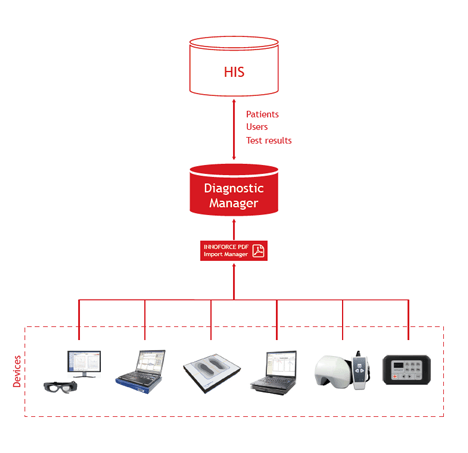 Would you like to know more about the Diagnostic Manager or do you have any questions? Then contact us today. We would be pleased to receive your inquiry!